The genesis of the conspiracy comes from the onslaught of media reporting of this horrific “BREAKING NEWS…” As word of converging law enforcement to the massacre went from the Newtown Bee, the local newspaper to the media capital of the world, just 75 miles south, reporters merged upon Newtown from 684/84 and from the air. The formula for misinformation was complete…hundreds of cops from different departments, hundreds of reporters from different media, a public clambering for information, deadlines, competition. This was a story that could “make” a reporter, a story that could give the network broadcasting the “latest” information a leg up in ratings. In the first 24 hours of any story there is misinformation…whether it was a misinterpretation of an event such as seeing a man handcuffed at the scene and assuming he was part of the massacre rather than a parent who had cut cross country to get to his kids faster or if it was collecting snippets of information from different law enforcement personnel and assimilating them incorrectly, errors occur. But in those errors come the seeds of conspiracy. There were four handguns OR there were three semiautomatics OR the AR-15 was in the trunk OR a shotgun was found in the trunk. In normal news cycles reporters have time to check their sources, to double check the validity of a claim. When breaking news hits, much of that quality control is thrown aside…the 24/7/365 news machine, from broadcast news to web sites to newspapers want it first. When it is right, it is magic, information instantly at your fingertips…when it is wrong, it can be total failure. With the passage of time the incorrect reports are solved. Layers of information, without the rush to feed breaking news can be assimilated, analyzed, and most importantly verified. But conspiracy theorists rely on too many original reports, too many turns of phrase at news conferences, and too many “questions” that propagate through the blogsphere…”Two unidentified NUNS who were seen leave scene at Sandy Hook”, “SMOKING GUN OF SANDY HOOK HOAX. REHEARSAL OF VICTIM EVACUATION”, “Foreign Swat Team Participated in Sandy Hook”, and then there is THIS. 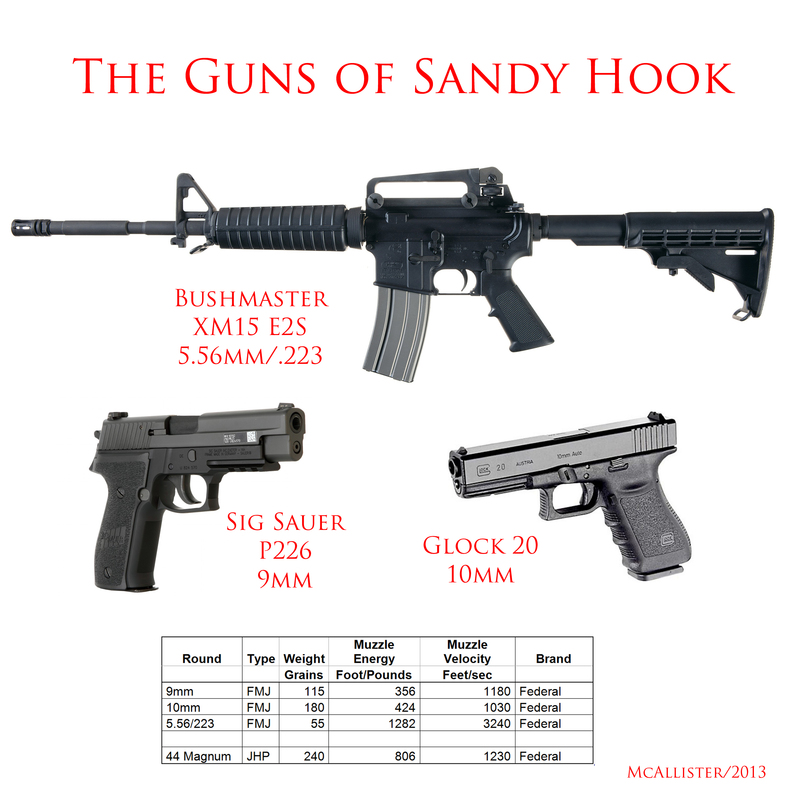 Now, let’s look at the facts regarding the guns that have emerged in the many days since the massacre. First, what guns were in the school? This is really simple. We have both the coroner’s news conference the day afterward where he explains that “all the wounds were caused by the long gun [the Bushmaster 223, AR-15 clone] and we have the Department of Emergency Services & Public Protection’s report that the guns seized inside the school were a Bushmaster .223 caliber — model XM15-E2S rifle with high capacity 30 round magazine, Glock 10 mm handgun, Sig-Sauer P226 9mm handgun. Seized from the car in the parking lot, a Izhmash Canta-12 12 gauge Assault Shotgun. We further have an interview with the Connecticut State Coroner, H. Wayne Carver II on Sunday, December 16, two days after the event speaking about the lethality of the weapon used. In the initial reports it was reported that an AR-15 was “in the trunk”. The Ishmash Canta-12, from any distance looks very much like an AR-15 or AK-47 from which it is derived. It is easy to see how this part of the conspiracy began. Much of the rest of it, however seems to be based on the concerns by the gun enthusiast community that the entire event was staged to jump start a UN based New World Order plan to disarm America. And that last part…you can’t debunk it, you can’t argue it, it’s just too far over the fringe – in the land where conspiracies are born. This entry was posted on Thursday, January 31st, 2013 at 11:18 pm	and tagged with 2nd Amendment, AR-15, AWB, conspiracy, conspiracy theory, firearms, GOA, gun, gun control, gun culture, gun owners, gun violence, homicide, murder, NRA, Sandy Hook hoax, Second Amendment and posted in Politics of Guns. You can follow any responses to this entry through the RSS 2.0 feed. A 30 round magazine for an AR is standard capacity … 100 round drum mags would be high capacity . And a AR-15 is M-16 clone . Possibly a shotgun slug or maybe even a 10 mm round from the pistol .